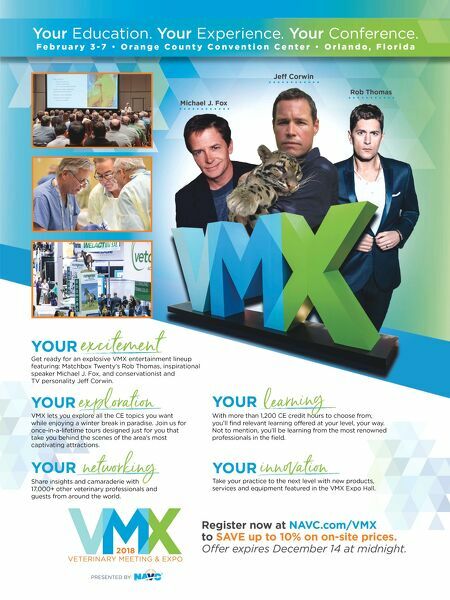 38 Today's Veterinary Business Leadership Unfortunately, veterinarians and veterinary technicians do not receive much dentistry training while in school. Many practices don't put enough emphasis on dentistry and the importance of a healthy oral cavity. In some small animal clinics, dentistry accounts for less than 10 percent of gross income. When a proper dental pro- gram is in place, dentistry can con- tribute an additional 25 percent of the overall income. It's a great way to regain lost business. Education and Words Matter Statistics show that 25 percent of clients will accept whatever you say immediately, 60 percent will take time to accept your recommenda- tions and 15 percent will not accept your suggestions. It is our job as veterinary health professionals to promote dentistry. How can we do this? Early testing, dental report cards, free tooth- brushes and sample packets, and market- ing are a few ways. The technician is often responsible for client education. Start the education at the first puppy or kitten visit. Talk about the importance of good oral care by pointing out that the mouth is a mirror to the body. Offer handouts explaining the rela- tionship between oral disease and systemic health. Using a simple diagnostic test strip at each wellness visit can increase the number of dental procedures performed at the clinic. The test is done in the exam room and detects thi- ols, the byproducts of the pathogenic bacteria present in periodontal disease. The test can detect a periodontal pocket that would not be visible during a conscious oral ex- amination. Doing the test with the pet owner present changes the conver- sation from an opinion — yours — to visual proof that infection is present. Changing the terms used with clients can have a dramatic impact, too. Stop saying, "Your pet should have a dental soon," and instead say, "Your pet is showing signs of oral infection and needs to have a com- prehensive oral health assessment and treatment." The term "dental" can leave the client wondering if the procedure is needed or just a cosmetic fix. Replacing "should" with "needs" helps the owner understand the importance of the procedure. Eighty percent of adult dogs and 70 percent of adult cats have some form of oral disease. Dental problems are among the top three concerns raised by dog and cat owners. Why is the incidence of oral disease so high? Is it due to a lack of compliance or a failure to educate the client about the importance of dentistry? Pets living longer is one reason oral disease is so prevalent. We improve so many aspects of their lives, but dental care seems to be lagging. 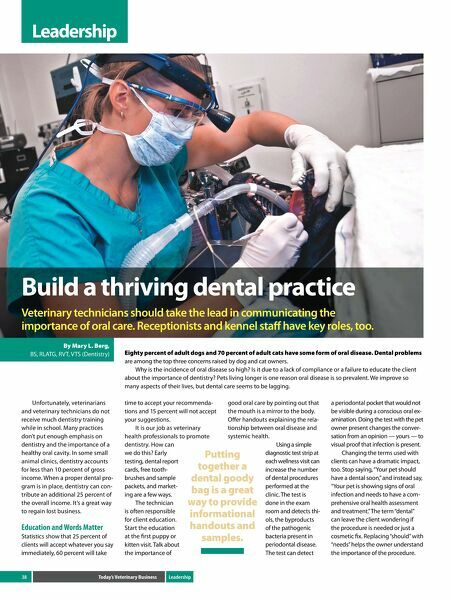 By Mary L. Berg, BS, RLATG, RVT, VTS (Dentistry) Leadership Build a thriving dental practice Veterinary technicians should take the lead in communicating the importance of oral care. Receptionists and kennel staff have key roles, too. Putting together a dental goody bag is a great way to provide informational handouts and samples.